A crossing to prioritise pedestrians and bike riders was opened last week at Taylor Square in Sydney. Known as the Rainbow Crossing, it celebrates LGBTQI community ahead of the 2019 Mardi Gras and provides a colourful clap-back to the 2013 removal of a similar crossing on Oxford Street ordered by then Roads Minister Duncan Gay. The crossing provides further cause for celebration by people who walk or ride bikes as they, not motor vehicles, will have right of way. Street design usually focuses on the carrying capacity of motor vehicles and maximising their travel speed. In the Sydney CBD during peak times, pressing a pedestrian button does not achieve anything. Traffic light cycles are set to prioritise motor vehicles, forcing pedestrians to wait about 90 seconds to cross. London, aims to become the world’s most walkable city, has average wait times of 40 seconds. NSW has a long way to go to catch up. Active transport benefits everyone by reducing congestion on roads and public transport, increasing the mental and physical well-being of walkers and riders, and through reductions in air pollution. 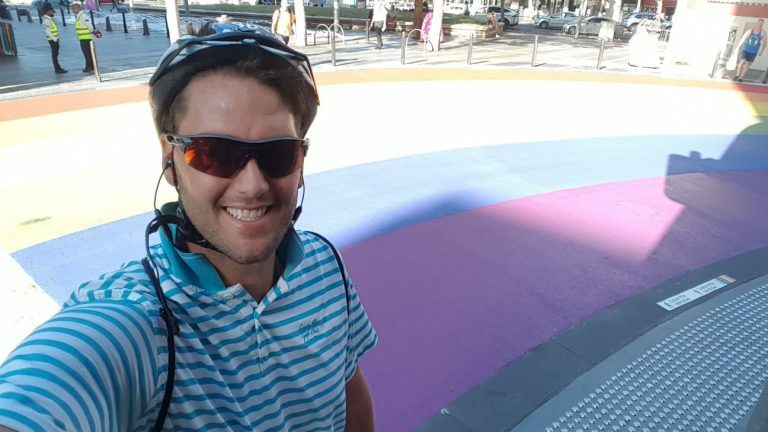 “We applaud the great work by the City of Sydney prioritising walking and cycling, and celebrating inclusion,” commented Bicycle NSW CEO, Alistair Ferguson. “This kind of place-making could be used to celebrate areas of Indigenous and historical significance, transforming roads into engaging landmarks and cultural precincts,” said Alistair. Bicycle NSW is calling on more NSW Councils and the NSW Government to get creative in celebrating communities with crossings that prioritise active transport over the movement of motor vehicles, and recognise social and cultural values.